This recipe is a refined version of something I threw together as part of my 30 recipes challenge and was inspired by the popular idea of a vegan 'tuna' style salad made from mashed chickpeas. Before the challenge I'd never been a big fan of chickpeas but this recipe definitely changed my mind! I couldn't believe how quick and easy it was to make and I instantly knew it would become a go-to lunch for me in future. My favourite way to serve this chickpea salad is with a mixture of brown rice and red lentil pasta, but it would also taste great paired with crisp lettuce in a sandwich, pitta or wrap. This salad also keeps well in the fridge for a second serving the next day. Drain and rinse chickpeas*, then place in a medium size bowl and mash with a fork. 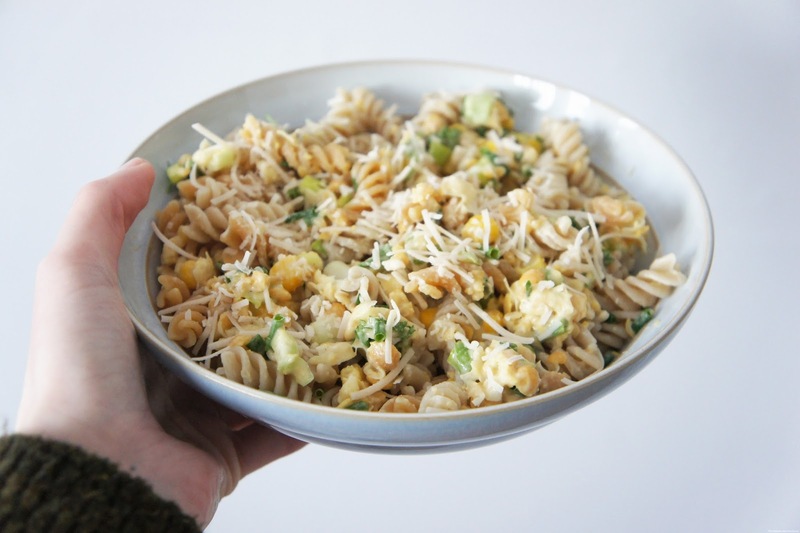 Add spring onions, sweetcorn, lemon juice, salad cream, garlic granules, nutritional yeast flakes and herbs to the bowl and stir well to combine. You may wish to add extra salad cream/mayonnaise at this point to achieve your preferred consistency, and extra fresh herbs to taste. Season with salt and black pepper to taste before serving. *Don't forget to save the liquid for use in other recipes! Please let me know if you try out this recipe & share your photos with me on Instagram (@sawyerandscout) using #anaturaldetour - I'd love to hear from you!